Cinnamon coated almonds could be one of the more mischievously decorated nuts. I call them spiced nuts, as cinnamon is one of my favorite spices; although my wife reminds me that the second ingredient in the cinnamon almonds carried by Trader Joe’s is sugar, arguably to encourage the cinnamon to remain affixed to the almond. This was the in-the-car-on-the-road-trip debate as we departed the Portland area and made our way east towards relatives in Hood River, Oregon. Driving along the Columbia River Gorge is probably one of the too-late experiences of my road-tripping repertoire. It was an amazing afternoon in the car – not unlike any other scenic drive – but contrasted with another favorite drive along the Potomac on the George Washington Parkway or the random bridge crossing of any of the smaller estuaries or pockets of water in San Diego County, driving along the Columbia gives perspective of a no-kidding river. Rushing water, white caps from mountain wind, clearly flowing deep and wide (song time, anyone? ), a true force of nature awesome to behold. In between checking the speedometer and keeping the tires in between the white dotted lines, I kept stealing glances to my left, and assessing the incredible power of the water flowing down from the mountains to the sea. 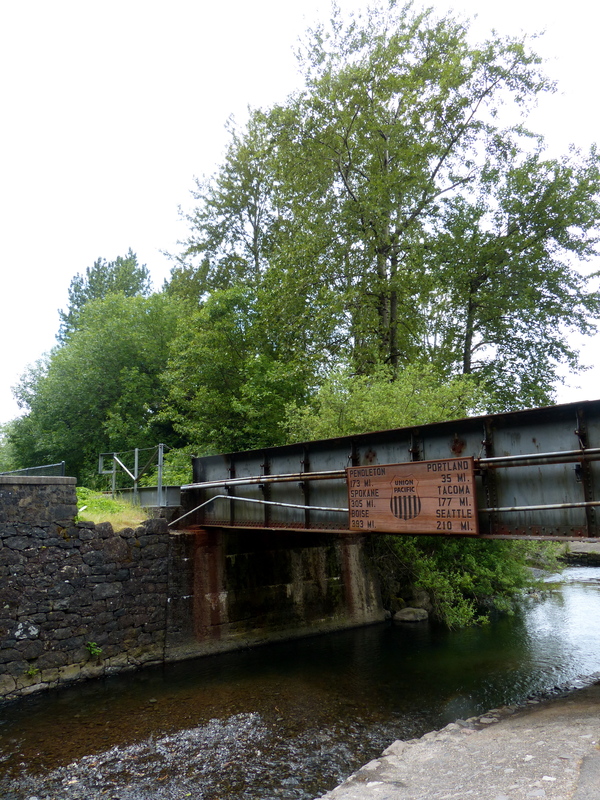 This was the state of my mental play as we closed the left-hand exit to the Multnomah Falls viewing point from Interstate 84 along the Columbia River. The flashing construction marquee advised us the parking lot was full, so we made quick plans to observe the falls in series, with me as driver circling the lot while Ms. WTWK traversed the highway and railroad underpass to snap a few shots. Both our girls were in nap-land, and had not passed the critical 90 minute elapsed nap-time for afternoon rest, so we made our game plan with quiet as a principal aim and used individual viewing of the falls as our MO, vice a collective, nap-rousing family outing to the viewing point. After spending a significant time in parking lot traffic, I found the BUS/RV parking area, clearly marked, but with nary a Bus or RV in sight. Instead, many sightseers and parking violators had haphazardly left their vehicles in varied manners of ‘parked’. About half had pulled their compact sedans all the way into the especially long bus slots, but the wiser and more precocious of visitor had parked half-way in, in order to preclude a second visitor from blocking his exit by parking behind them. Clearly among the most inefficient of parking strategies, from a macro viewpoint of visitor throughput to the falls. I chose to pull our mini-car (a minivan, but the kids like calling it a mini-car, and it soothes my psyche to allow the slight misnomer) alongside a BMW 3-series, shiny black in the afternoon sun and definitely owned by someone who did not give an extra think to which RV-embarked family was now robbed of their spot to park while visiting the falls. Since there was no one in the BMW, I paralleled about as closely as I could tolerate, knowing I had to open my own door to step outside in order to flag down my wife who would not think to look for me illegally parked in the non-passenger vehicle parking area. How else would I get to rotate through the sightseeing expedition if I never were able to swap roles from mini-car driver and napping-progeny guardian to avid phototourist? 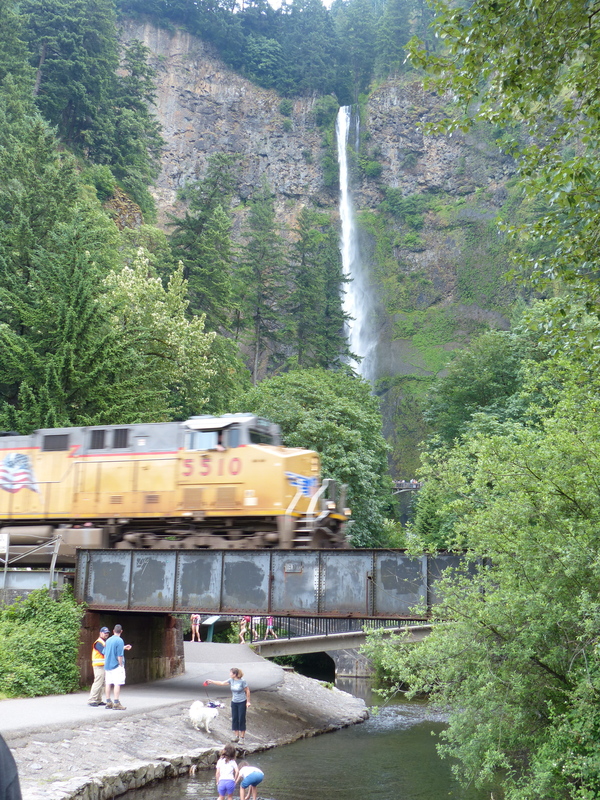 While standing at the end of my double-parked, BMW-Odyssey conglomerate in the RV parking space, I had a front row seat to the real tourist attraction at Multnomah Falls. The face slap/body push came so suddenly I could only think that I was a poorly performing member of the global campaign for voyeurism via smartphone uploads – I did not have time to get out my phone, type in the secret screen unlock code, select the camera app, and start my youtube contributor career in earnest with a high-stakes videodrama about illegal parking in the Multnomah Falls tourist parking lot. The Subaru driver had exited her vehicle, demanding from a passing family group of older tourists an explanation of how she was supposed to park her RV (two cars behind in the parking queue) in the RV parking lot when all of ‘you people’ had parked illegally. “Which car of yours should I take a picture of to give the police?” barked the RV advance party scout while slamming her Outback door. Before I could muster a feeble “I’m waiting for my wife and watching my kids and I’m actually just parked in the free space next to this BMW which is clearly shorter than my minivan which is like an RV without the recreational part” – the youngest female member of the partially septuagenarian tourist party launched out against the irate RV owner with a chest-bumping “what are you gonna do about it” which quickly turned into a face slap/jawbone push that drew in the assumed spouse of the lady pushing back on the Subaru driver. All the meantime my daughters slept peacefully in the van while I hesitated between texting my wife to come back now and selecting my camera app to instagram the Multnomah Brawl. Instead, I pocketed my phone while scanning for my wife’s return from the underpass, quietly started my mini-RV, and backed out of the parking spot, to resume my quiet, uneventful caution lap around the general public parking lot. The “thrillah at Multnomah” finished as quickly as it began, with the Subaru lady exiting in a huff, the family tour group lady rejoining her very quiet and possibly unaware older parents, and the RV a few cars back slowly continuing around the parking lot circle and eventually entering the westbound highway. I sheepishly followed the non-recreational vehicles seeking a place to park in the appropriate spots, lamenting my unpreparedness to capture the event on digital film, but grateful that I escaped the wrath of Subaru RV lady, and more emphatically rejoicing that both the kids remained asleep and unaware of the melee that day. This post is courtesy of my husband. I returned to the car after weaving my way through hundreds of falls-viewers. My husband eagerly relayed the details of the melee and I promptly said “That has to go on the blog. Will you be a guest writer?” So, thank you Sweety for writing! 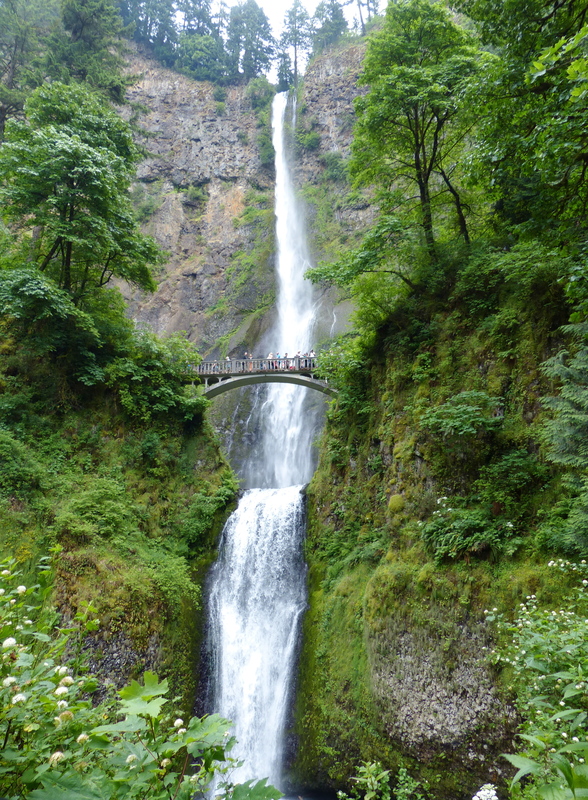 Photos are courtesy of me, since we chose to continue our drive as he didn’t want to subject me to the dangers of the Multnomah Falls parking lot. Yay for guest bloggers! :) Well done Drew, what drama! Really like the first picture Heidi. Good shot! Love this post 🙂 What a memorable trip to the Falls Drew never saw!! And beautiful photos. 🙂 So glad you guys are enjoying your cross country adventures! We miss you! Yeah, he needs to contribute more often. I love his perspective. And we are having a grand adventure! Thanks, Drew. Fun to read something by you! What a day!